The name itself tells us that this model will provide a thrilling driving experience and still excel in the comfort and versatility typical of its category. 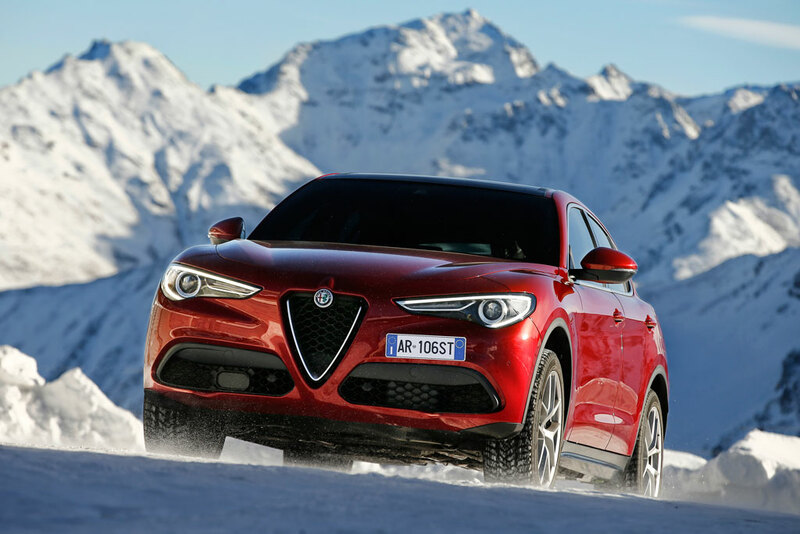 The Stelvio is Italy's highest mountain pass and Highway 38, which crosses it, over 20 kilometres in length and with more than 75 hairpin bends, has iconic status. 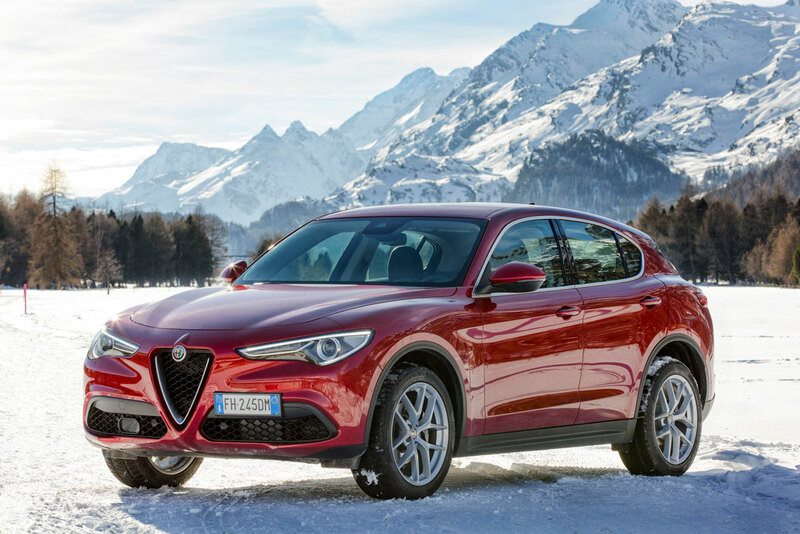 To enjoy it as it is meant to be enjoyed, alone or in the company of friends and family, there is now a SUV capable of offering an unrivalled combination of driving pleasure, Italian styling and versatility: the Alfa Romeo Stelvio. 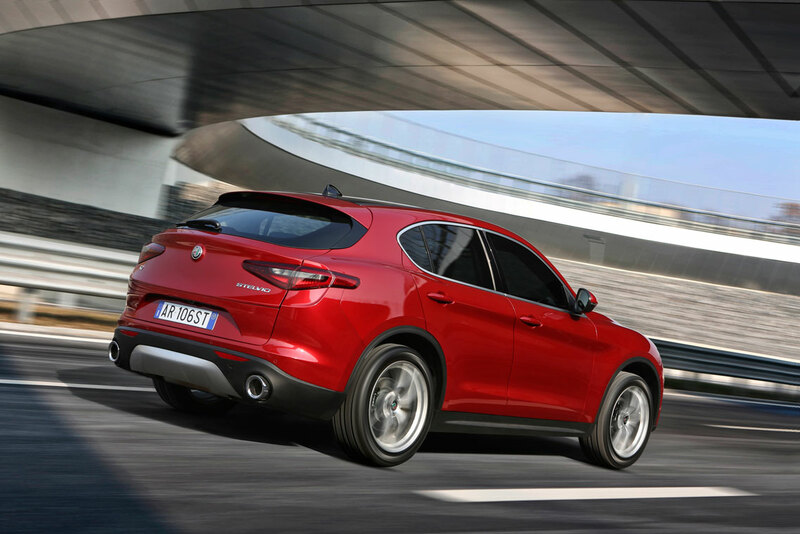 In true Alfa Romeo tradition, the new SUV delivers impeccable handling, worthy of a real sports car, proven by balanced weight distribution, the most direct steering ratio in the segment and state-of-the-art suspension with the exclusive AlfalinkTM technology. Not to mention the lavish use of ultra-lightweight, hi-tech materials including carbon fibre for the drive shaft and aluminium for the engines, suspension systems, hood, wings, doors and the tailgate. 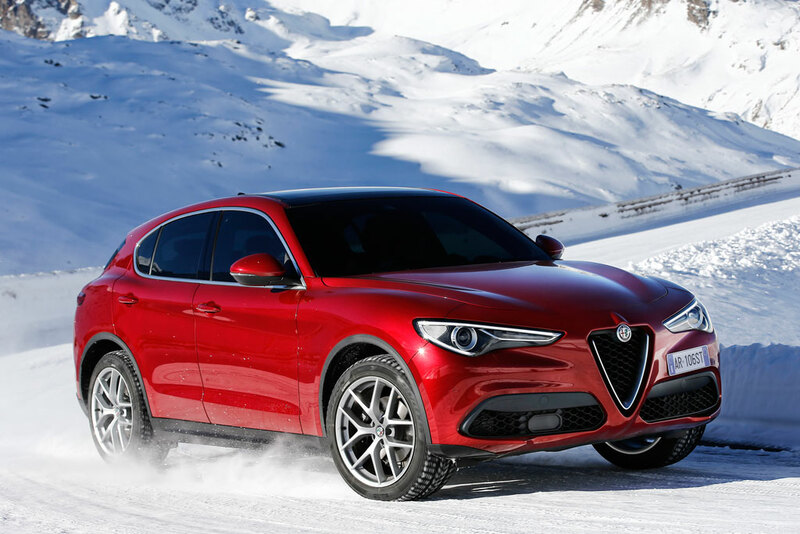 What's more, for the ultimate in road-holding, the Stelvio SUV offers the Alfa Romeo Q4 all-wheel drive system, and can be equipped with mechanical self-locking rear differential on request. More than just performance and handling, the car has plenty of room available for passengers to enjoy and share the pleasure of travelling regardless of the destination. The Stelvio's proportions, with a length of 468 cm, height of 167 cm and width of 216 cm, express strength, dynamism and compactness. Externally, its attractive line is the perfect blend of tradition, design and performance, an integral part of the brand's history, dating back over a century. 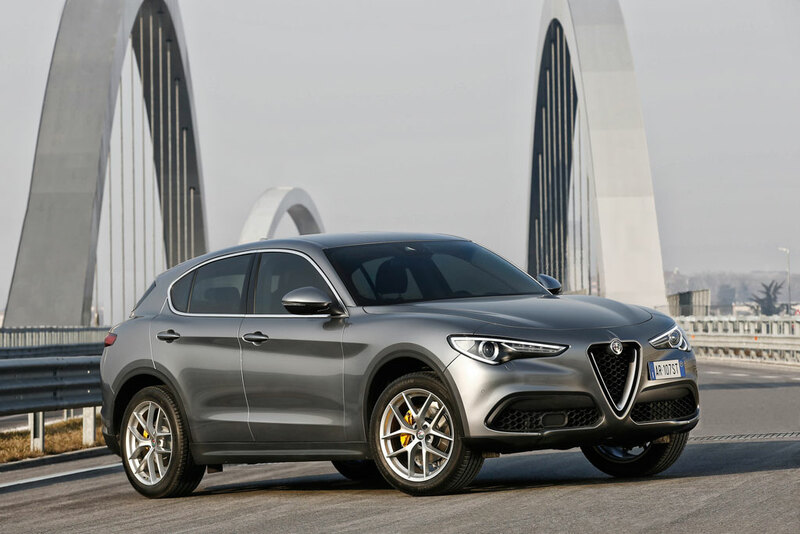 Achieving this mix, now as in the past, involves combining the three ingredients of Alfa Romeo design: proportion, simplicity and top-quality surfacing. 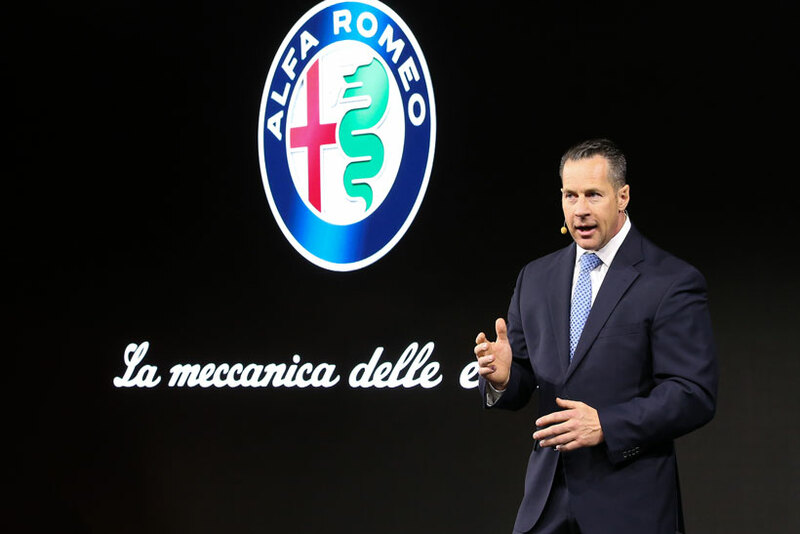 These same ingredients gave us the Giulia - the new Alfa Romeo benchmark and precursor of the brand's future - and have been comprehensively reworked to adapt them to the altogether different volume of a Sports Utility Vehicle. To underline its beautiful lines, the customer can choose from 13 body colours and 13 different alloy wheels, which highlight its sleek silhouette. The same elegantly sporty imprint is found in the interior, which is simple, stylish and tailored like a bespoke suit, with painstaking craftsmanship and premium materials: the leather, including full grain, real woods and fabrics have all been chosen for their visual and tactile appeal and assembled to give a palpable sense of human artistry. The driver is central, a concept underlined by the diagonal tunnel, the slightly undulating dashboard and the small, direct-ratio, leather-wrapped steering wheel that adapts effectively to all driving styles. Also provided is a clear TFT colour information display cluster (with 3.5” or 7” display) which supplies all essential information, while the driver/car interface consists of two rotary controls for easy, immediate use of the Alfa DNA selector and Alfa Connect system. Depending on the version, Alfa Connect has a 6.5” or 8.8” high resolution display, with integral 3D navigation function, the new frontier in infotainment developed in partnership with Magneti Marelli. 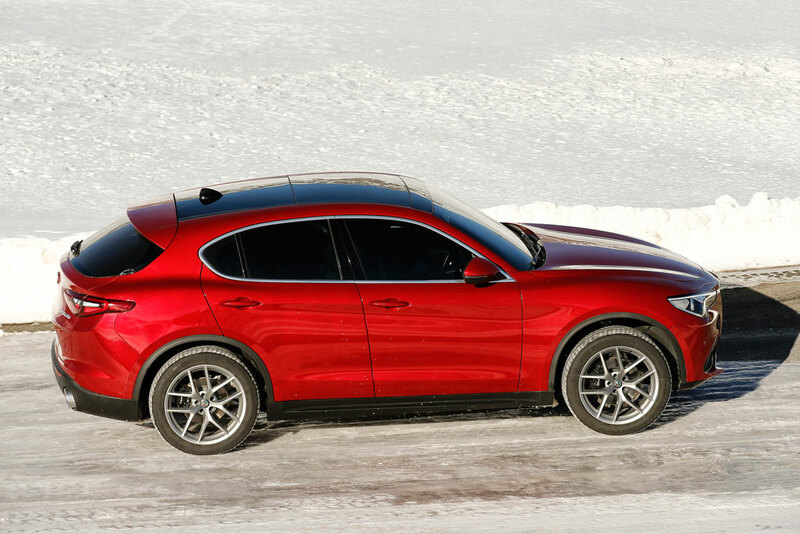 Alfa Romeo Stelvio features a large number of sophisticated safety systems, available as standard or optionals depending on the version. Key amongst them is the Integrated Brake System (IBS), the innovative electromechanical system that combines stability control with a traditional servo brake to deliver instantaneous brake response and hence record-breaking stopping distances. Not to mention Forward Collision Warning and Autonomous Emergency Brake with pedestrian detection, which give the driver an audible alert of a potential front collision and then activates the braking system, and Lane Departure Warning, which warns the driver if he strays across the boundaries of his lane. Also included is Blind Spot Monitoring (BSM) with Rear Cross-Path Detection, for continual monitoring of rear blind spots on both sides of the vehicle, alerting the driver in the event of potential hazards. Last but not least, Active Cruise Control automatically adjusts the speed to traffic conditions. Apart from its distinctive style and excellent handling, Alfa Romeo Stelvio reveals all its character with two powerfulengines - 280 HP 2.0 Turbocharged petrol-fuelled and 2.2 Diesel of 210 HP - which express all the SUV's sporty personality, guaranteed to give even the most skilled driver unique thrills, especially on mixed terrains. 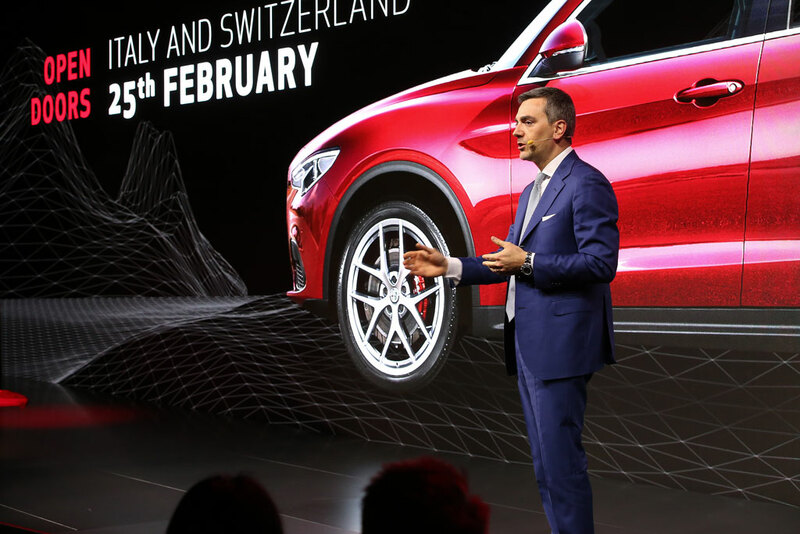 Combined with the automatic 8-speed transmission and Q4 all-wheel drive, these engines belong to a new-generation of all-aluminium four-cylinder units with carbon fibre drive shaft. Innovative and reliable, the Stelvio engines are the peak of the Group's technology and are built in Italy at the Termoli (petrol) and Pratola Serra (Diesel) plants, in areas assigned only to Alfa Romeo engines, with state-of-the-art processes and methods that put them at the top of their class in terms of performance and fuel economy. 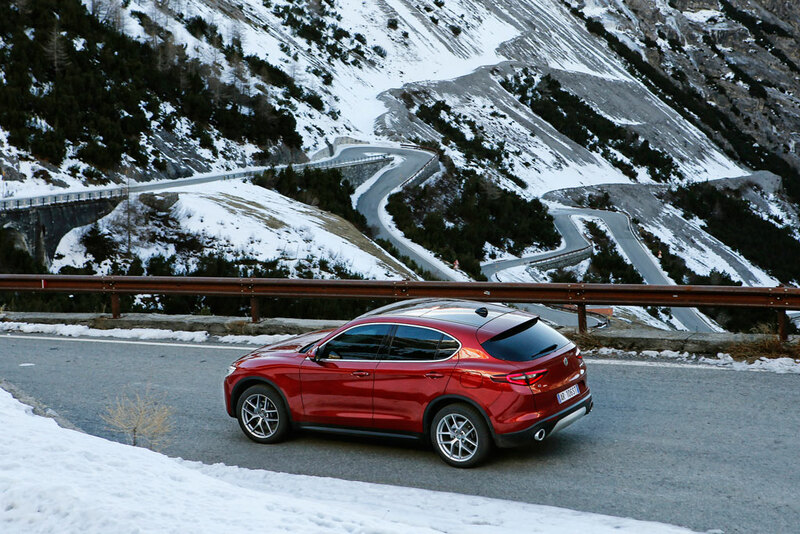 One fact will speak for all: the Stelvio 2.0 280 HP turbocharged Petrol engine is best in class in terms of acceleration, powering from 0 to 100 km/h in just 5.7 seconds. The range will be completed with new engines including the 200 HP 2.0 Turbocharged petrol-fuelled and the 180 HP 2.2 Diesel, both with an automatic 8-speed transmission and Q4 all-wheel drive. The 180 HP 2.2 Diesel will also be available with real wheel drive. Alfa Romeo Stelvio brings the secrets of Italian hospitality into the world of the medium-sized premium SUV: its interior is exclusive, tasteful and elegant. The interior also has plenty of room available for passengers to enjoy and share the pleasure of travelling. But that's not all. 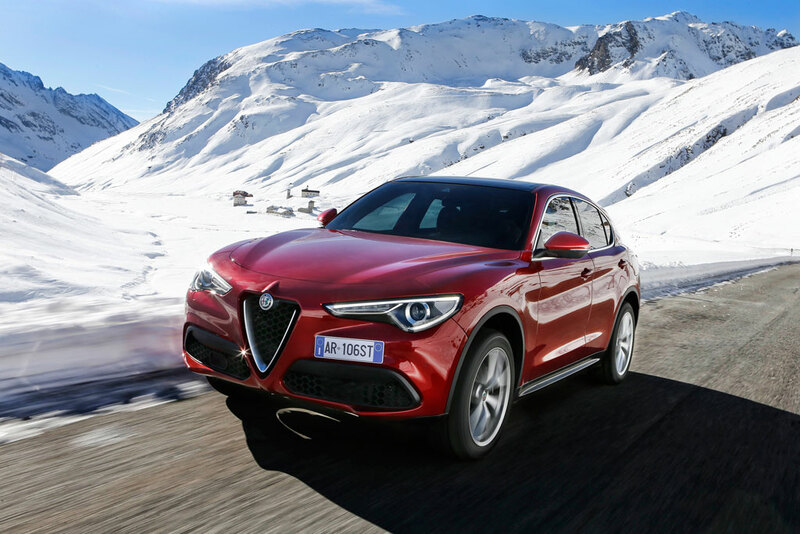 The model gives the driver a feeling of complete control and mastery of the road, thanks to the new Alfa DNA selector but above all to the high driving position, which does not detract in the slightest from the driving pleasure expected of a genuine Alfa Romeo sports car. 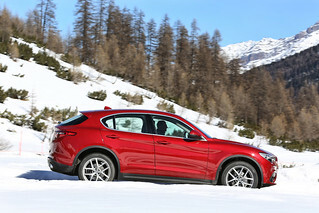 It also ensures a high level of on-board comfort with the dual zone climate control system, the sophisticated Alfa Connect infotainment system and a fine audio system, with 8, 10 or 14 speakers (in this case by Harman Kardon) depending on version. 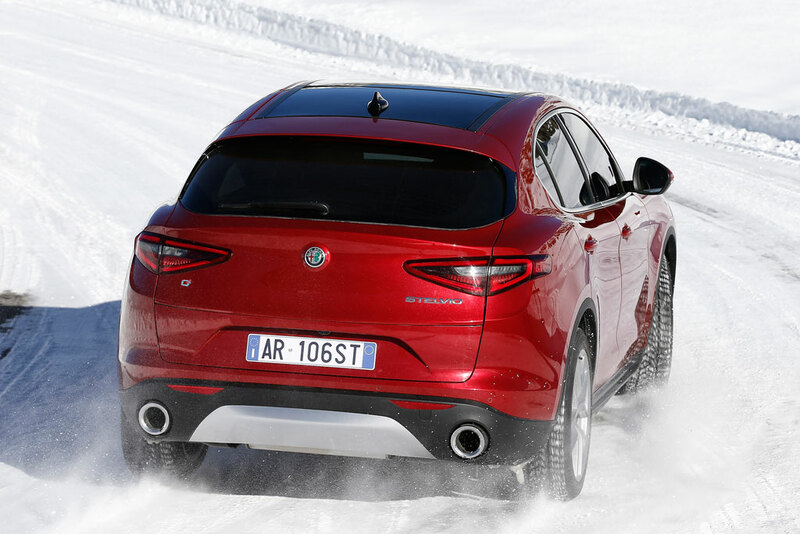 Last but not least, the 525 litre boot is in line with the best competitors and has a convenient electric tailgate that can be set with eight different opening levels, directly from the Alfa Rotary selector. The Stelvio SUV is tailored in all respects to embody Italian good companionship, comfort and taste. 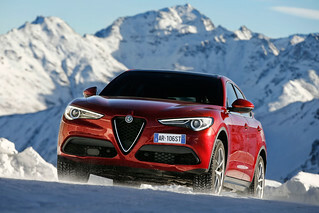 Depending on the markets, the range comprises three versions (Stelvio, Super and Business). At the time of launch, the customer can choose from 13 body colours and 13 alloy wheels (from 17" to 20"). 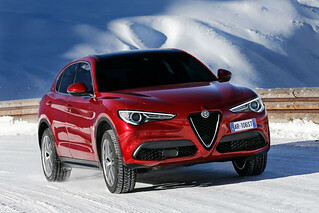 The Stelvio version is lavishly equipped with, for example, 17" alloy wheels, 6.5" Alfa Connect wheels, Alfa Rotary selector, 8-speaker audio system, black fabric seats (front with sliding, reclining and height adjustments), Integrated Brake System (IBS), Lane Departure Warning (LDW), and Forward Collision Warning (FCW) with Autonomous Emergency Brake (AEB) and pedestrian detection. This version's outfit is completed by parking sensors, cruise control, electric tailgate and dusk and rain sensors. The Super version is even more complete, with exclusive interior and exterior features: 18" alloy wheels, techno-leather and fabric seats in three colours (black, black/brown and black/red), and three options (black, black/brown or black/red) for the dashboard and door panels and sill with steel insert. To conclude, Stelvio Super can be ordered with the optional Luxury Pack – including in particular full grain leather seats (in black, brown, red or beige) with electrical adjustment and heating system, as well as real wood inserts - and the Sport Pack, including heated sports steering wheel with specific grip and leather wrapping, racing-style leather seats in black, red or brown, with electric adjustment and heating system, aluminium inserts and steel pedal. 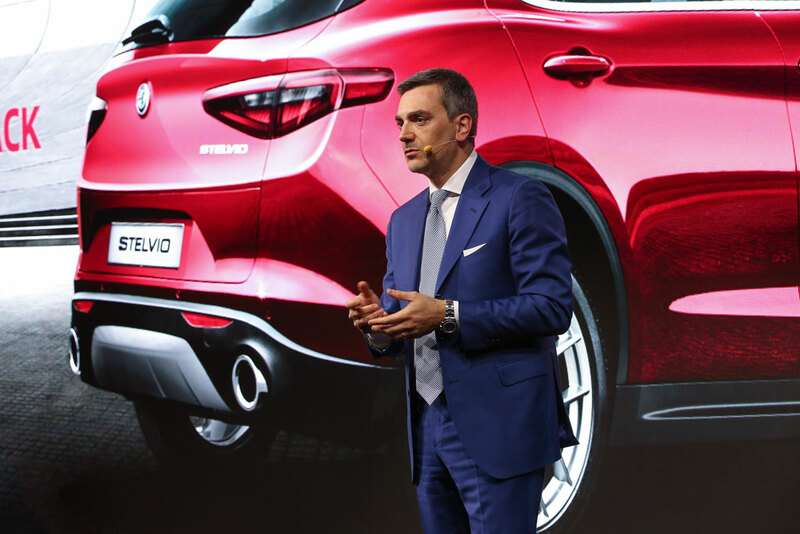 There is a strong focus on the fleet, corporate and professional market, with the development of a specific version for this category of customers: Stelvio Business. Only available with Diesel engine, it features the 6.5" Alfa Connect 2D Nav, 35 W B-Xenon headlights with AFS and electric folding mirrors. 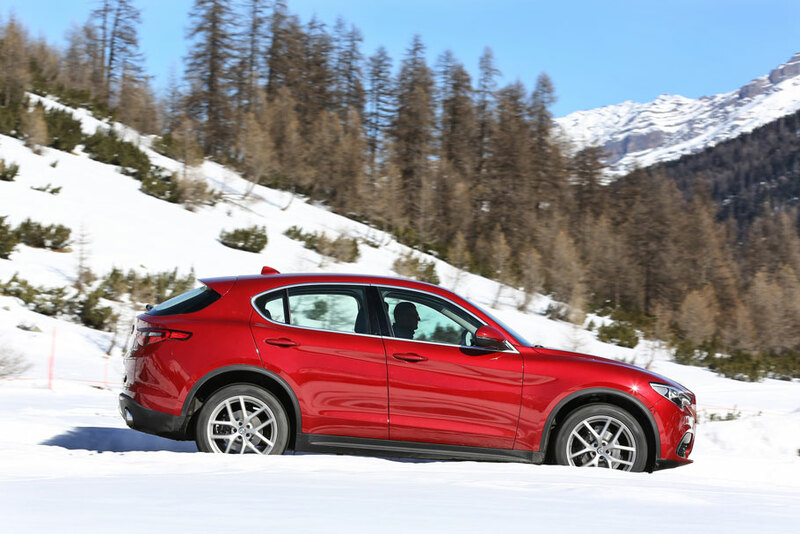 In other words, a car complete with everything it takes to ensure enjoyable motoring for those who use Alfa Romeo Stelvio for both work and leisure.